Gaza terrorists fire a barrage of rockets just moments before one ceasefire is set to end and a new one to begin. Gaza terrorists fired a barrage of rockets towards southern Israel on Wednesday night, just moments before one ceasefire was set to end and a new one to begin. 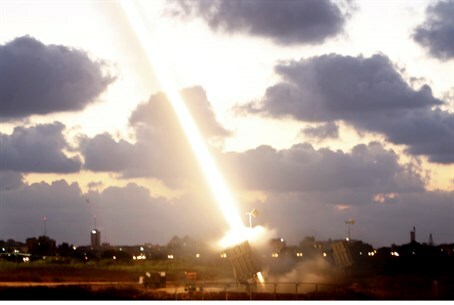 The Iron Dome anti-missile system intercepted one rocket over the city of Netivot. Two other rockets exploded in the Sdot Negev region. There were no physical injuries or damages. The latest rocket fire came just before midnight, when a 72-hour ceasefire was set to end. Moments before midnight, Israel and the Palestinian Arabs agreed to extend the 72-hour ceasefire. The new ceasefire will last five days, said senior Palestinian negotiator Azzam al-Ahmed, after he and other officials initially spoke of another 72-hour lull. The extension was announced even though Hamas violated the previous ceaseire just after 9:00 p.m. when it fired at least one rocket towards the Hof Ashkelon area. Hamas spokesman Sami Abu Zuhri denied, however, that the group fired any rockets at Israel.